The Japanese Card of the Day for April 18th, 2018, is a Kagerо̄ grade 1 from V-Trial Deck 02: Kai Toshiki, Dragon Knight Burj. While the Start Deck version of Burj had a fairly low base power for the format at just a 7k base, the new Burj is even weaker--and has an incredible skill to pay that back. Burj functions like an additional use of Force that retires any of your opponent's rearguards while simultaneously refueling the soul for Bahr, Berserk Dragon, and Dragonic Overlord. It's a successor to Demonic Dragon Mage Kimnara, and a card that has to be used carefully. At this time Kagerо̄ lacks draw power compared to their immediate rival, Royal Paladin, so any loss of card advantage incurred by giving up a unit like Burj represents a permanent long-term commitment to playing with fewer cards. You have to ensure that using Burj will actually conserve more shield than you lose by having to give up both him and dedicate a new booster to the board, and target the right cards. 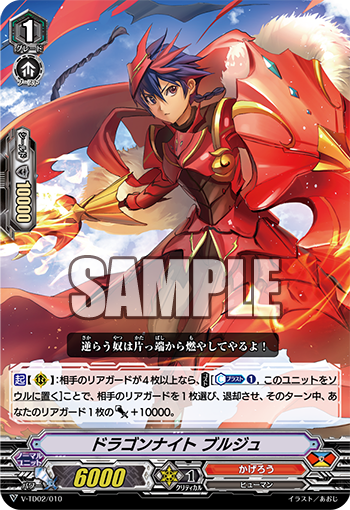 Knight Squire Allen is a poor target because the opponent is likely to call over him anyway to get another Little Sage Marron into play, while Marron is the perfect target because he has a long-term use for the opponent and can reuse his skill every time another unit is called to his column. Blaster Blade would make for a poor target because his rearguard skill is one-and-done, while his Wingal booster would be ideal because of its continuous boost to Blade. Jarron is one of the big finishing moves in the Royal deck right now and so has high priority as a target. Another factor to consider with Burj is the order of effects. Because Burj is only active when the opponent has 4 or more rearguards in play, the ideal time to use him is as your first retire of the turn. Using Berserk Dragon first could put the opponent down to 3 rearguards, disabling Burj--thus you're encouraged to play Burj early as a 6k booster, then give him up later in the game after the opponent has put down a board and you're ready to call a better booster like Bahr. As for where to allocate the power, while you could power up Dragon Armored Knight or another beater, you should be aware that you can just pass Burj's power onto the vanguard's booster to make your Overlord swing stronger. Of note is that there are only 3 copies of Burj per Trial Deck, so if you want to go for an average ~2 Burj per game you'll need to either pick up two copies of the TD or buy a single of Burj on top of your initial deck purchase. Dragon Knight Burj is illustrated by Aoji, who previously illustrated Spectral Blaster “Diablo” and Defeat Flare Dragon. The previous Japanese card of the day was Gigantech Charger. V-Trial Deck 01: Sendou Aichi and V-TD02: Kai Toshiki will launch in Japanese May 11th, 2018, and in English June 8th, 2018. They will be accompanied by a new sleeve based on the "Imaginary Gift" design. The first Booster Set of the Standard format, V-BT 01: UNITE! TEAM Q4 will launch in Japan May 25th, 2018, and in English June 22nd, 2018. It will be accompanied by sleeves based on Dragonic Overlord and Blaster Blade. The first Extra Booster set of Standard, V-EB01: The Destructive Roar will launch in Japan June 29th, 2018, and August 3rd for the English-speaking world. The accompanying new anime series, codenamed "Origin," will begin airing May 5th, 2018, on TV Tokyo and affiliated stations. It will be simulcast with English subtitles on YouTube and Crunchyroll.